Random musings and observations about the state of human rights and human rights laws, democracy, justice, secularism, peace and, off course, the life and all its paraphernalia with particular reference to Barak valley. (1) Since 1951, the rate of increase of Assam's population has been much higher than that of the country as a whole or of any state or province. But unlike in other states, this heavy increase has been due to (a) an acceleration of the natural rate of increase; (b) influx of Hindu refugees from East Pakistan; and (c) heavier migration of Indians from the rest of the country. 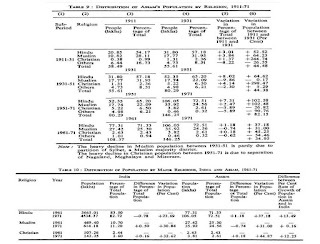 (2) The tremendous swelling in the number of the, Assamese speaking population during 1911-31 as a consequence of people belonging to other language groups adopting Assamese language is a unique instance of its kind. (3) Apprehensions about the infiltration of Bangladeshi or East Pakistani Muslims into Assam appear not to be supported by facts. The fact is that while it was mainly the Bengali Muslims, motivated by economic as well as political factors, who migrated to Assam between 1891 and 1947, such migration as has taken place' since 1947, almost entirely due to political reasons, has been of Bengali Hindus. There is a general and widely held apprehension, both in Assam and in the rest of the country, about 'Muslim infiltration' in the state. "The frustration is further fueled by fears that in the not too distant future, they may be swamped by 'foreign nationals', mostly Muslims from Bangladesh". It is presumed that such Muslim 'infiltrators' into Assam got assimilated with the Assamese speaking population following the practice of their predecessors. If this presumption is correct, two things must follow. First, being an addition to the bonafide Muslim, nationals living in Assam, and given their natural rate of increase which is generally higher than that of the Hindus, there should have been a steep rise in the Muslim population of Assam, at least at a rate higher than that of the Muslim population in the rest of the country. Secondly, since these are supposed to have adopted Assamese, there should have been an equally steep hike in the Assamese speaking population. It has been found above that between 1951-71, there was no hike in the Assamese speaking population and the rate of increase was quite normal in the decade 1961-71. This part of the presumption is thus not tenable. that took place between 1911-31. 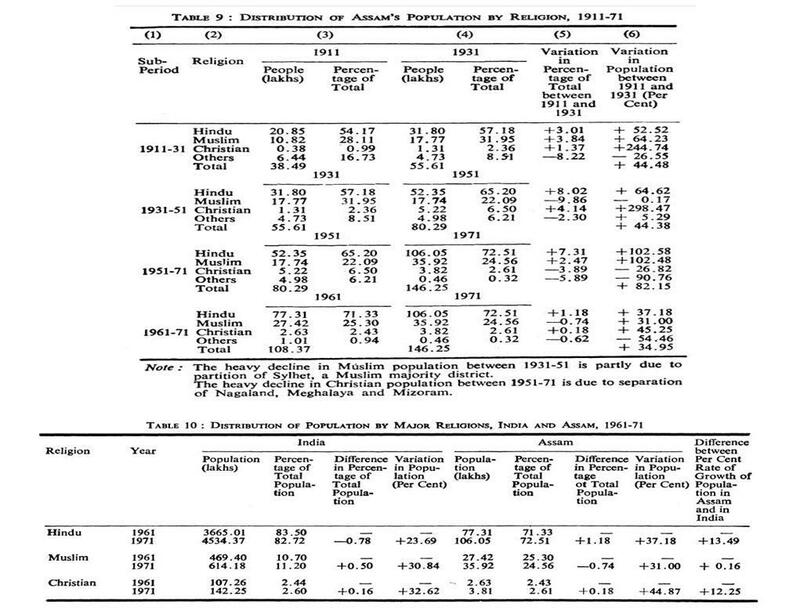 When the distribution of population by religion of Assam for the decade 1961-71 is compared with that of India, it is found that (i) the Hindu population of India as percentage of total population declined during this period by --0.78 per cent while that of Assam increased by 1.18 per cent; (ii) the Muslim population of India went up by 0.50 per cent while that of Assam declined by --0.74 per cent; (iii) the Christian population of Assam increased at a faster rate than that of India and (iv) rate of increase was lowest for the Muslims of Assam compared to the Hindus and the Christians. All these are evident from Table 10. These lower figures for the Muslim population of Assam in all respects compared to those for the Indian Muslims also confirms that apprehensions about 'infiltration' of 'Bangladeshi Muslims' are not factually tenable. This also reveals that since the people opting for adoption, namely, the Bengali Muslims, have become scarce, the Assamese language has failed to swell since 1951.